GE Intelligent Platforms recently announced the availability of their latest test and measurement system, the Proficy Accelerator Solution for Weighing Operations. The Weighing Operations Accelerator Solution digitizes the highly manual process of pre-production ingredient preparation and recording, reducing ingredient variation in food, beverage, CPG and life sciences manufacturing to increase product quality and safety. By guiding operators through step-by-step instructions, automating Weigh Orders, and tracking actions and ingredient data for historical records, this out-of-the-box test and measurement solution reduces errors and waste. “There are many challenges in Weigh and Dispense operations, including variability and risk of human error, inefficient and inaccurate recordkeeping, and complex and changing recipe formulations that often require expert operators,” says Sheila Kester, General Manager, Operations Management Solutions for GE Intelligent Platforms. 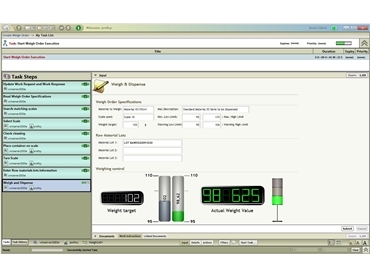 Proficy Accelerator Solution for Weighing Operations combines full-featured software and a rapid engagement model that allows users to quickly automate and optimize Weigh and Dispense processes. historical data recordkeeping, with report file generation for use in label printing, inventory updates, etc. Proficy Accelerator Solutions combine the right blend of software and services components for a specific industry application or process. These offerings serve to rapidly prove the value of the solution with faster results than traditional projects for quicker ROI.